On the 50th floor of a global law firm, overlooking a cold and rainy Manhattan skyline in November, more than 70 Harvard Business School alumni gathered to learn from each other and confront the business implications of climate change together. Hosted by the HBS Business & Environment Initiative and the HBS Club of New York, the event offered faculty and alumni perspectives on the role of the investment community in addressing climate change. Professor Joseph Lassiter served as moderator of the four-person panel, which included Hui Wen Chan (MBA 2010), vice president of corporate sustainability at Citigroup; Michael Ellis (MBA 2008), managing director of Inherent Group; Claire Broido Johnson (MBA 2002), president of CBJ Energy; and Jackson Lehr (MBA 2007), director of distributed energy ventures at National Grid. Lassiter kicked off the discussion by recalling a series of alumni events he ran in 2009 in San Francisco, Houston, and New York, where he asked the audience about their attitudes on climate change, doing a “show-of-hands” survey. At that time, about half of the New York alumni who participated advocated for swift US government action to address climate change. Now, a decade later, more than three-quarters of New York event participants called for the US government to act quickly—suggesting that at least New York alumni perspectives may have shifted. Pointing to evidence such as the latest IPCC Special Report-Global Warming of 1.5°C, Lassiter reminded participants to look at the available data in order to confirm or challenge prevailing views of the world. Climate change is a worldwide problem that requires a worldwide mindset, he noted. Similarly, the need for low-cost clean energy is a worldwide problem, particularly as the developing world aspires for the standards of living that the developed world takes for granted. The panelists agreed that the world is warming faster than scientists anticipated even a few years ago and that, for investors, a changing climate offers many opportunities. These include technologies focused on climate mitigation, such as renewables (wind and solar), nuclear power, battery storage, electric vehicles, and plant-based proteins (“fake meat”). Adaptation technologies, like flood defense and asset protection, also offer potential investment opportunities. Panelists also pointed to entire sectors, such as shipping and aviation, as well as land-use and climate-resilient infrastructure, which will require massive injections of capital in order to remain sustainable. Alumni were urged to be the change agents and ask the tough questions; now more than ever taking that extra bit of risk might yield much needed investment and societal returns. Lassiter reminded the room that there are many levers that can be played in the game, but that the game is playing out at a rapid pace. Lehr, from National Grid, talked about finding that sweet spot when it comes to pushing, even prodding, leadership for change, referencing different lessons from David Crane, formerly CEO of NRG, and Paul Polman of Unilever. Chan, of Citigroup, spoke of the enormous potential and necessity of greening every industry and called for taking personal responsibility--even if just with individual 401ks. She urged alumni to find out how their money is being used and advocate for climate-smart investments. Looking ahead to 2030, Ellis, of Inherent Group, emphasized opportunities in water reuse and efficiency, and Broido Johnson, of CBJ Energy, highlighted low-tech but high-impact solutions involving smart land-use practices, such as sequestration, grasslands, and the food and agricultural sector. Audience members also contributed climate-smart investment advice, ranging from the role of bicycles in cities to alternatives to plastic and “single-use stuff.” More controversial solutions were also raised, such as nuclear energy and geoengineering, which, like all technologies, pose specific societal and environmental risks but might be necessary for keeping global conditions manageable. In closing the event, Lassiter urged participants to communicate more with their HBS sectionmates, especially those living in different ways and places. Acknowledging that no one gets a free pass when it comes to climate change, Lassiter said alumni must continue to exchange and act on those novel ideas critical for securing a climate-stable future and building a more sustainable economy, where energy consumers bear the true cost of their own energy consumption. 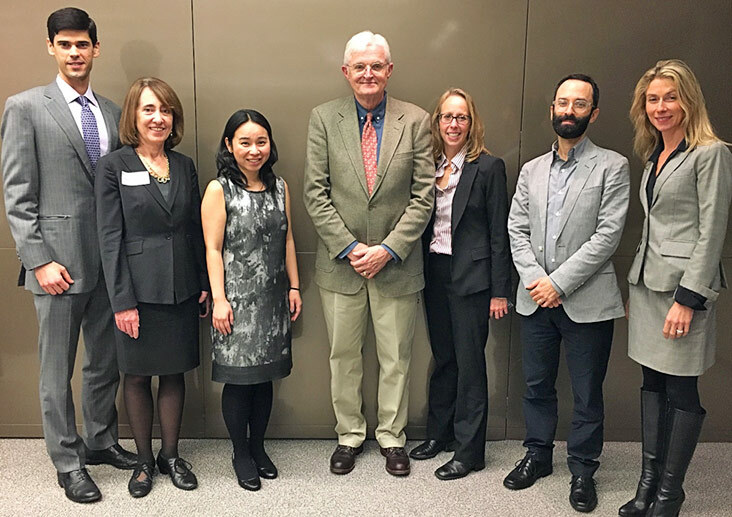 This event was part of a series of alumni events focused on climate change organized by BEI and leading up to an HBS alumni conference in the coming academic year, chaired by Professor Ramana Nanda and Professor Michael Toffel. For information, please contact bei@hbs.edu.